BERKELEY, CA: More than 30 high-profile figures, including President Obama’s housing secretary, a former US senator, and the mayor of New Orleans, are set to participate in a major, three-day conference from Feb. 27 to March 1 at UC Berkeley examining issues around race, segregation, and inequality in the US. The Race & Inequality in America: Kerner@50 conference, which is being organized by UC Berkeley’s Haas Institute for a Fair and Inclusive Society, and co-sponsored by the Economic Policy Institute and Johns Hopkins University, will coincide with the 50th anniversary of the release of the Report of the National Advisory Commission on Civil Disorders, more commonly referred to as the Kerner Commission Report. The Kerner Commission was established by President Lyndon B. Johnson to investigate the causes of the wave of civil unrest--often deadly--in cities across the country during the summer of 1967, and offer recommendations to prevent similar incidents from reoccurring. “The unrest was in part a response to police brutality, and in part response to being locked out of the system, in what were the last vestiges of a racial caste system that kept the Black community largely excluded from participating in American life,” Haas Institute Director john a. powell, an expert on race, said. But half a century since the tumultuous events of that period, deep racial divisions and inequalities in the areas of housing, education, jobs, wealth, health, and police-community relations remain pervasive around the country, with renewed public attention being brought to those issues in recent years through campaigns and different forms of protest, such as those led by the Movement for Black Lives. 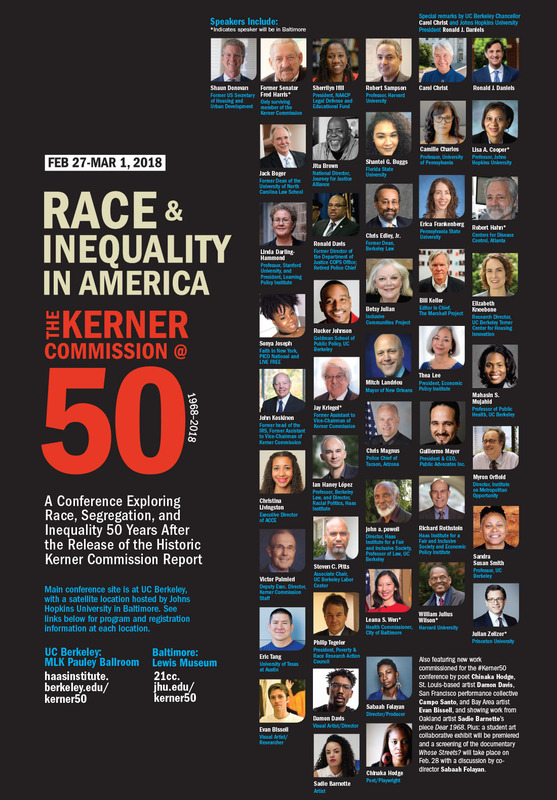 At the conference, which will take place on UC Berkeley’s campus with a satellite location at Johns Hopkins University in Baltimore, eight panels examining a specific issue, each featuring three relevant experts and a moderator, will look in depth at some of the themes of racial inequality detailed in the Kerner Commission Report, compare them to our present realities, and develop a policy agenda to address them in sustainable ways. Shaun Donovan, who served as secretary for the US Department of Housing and Urban Development (2009-2014), and Sherrilyn Ifill, president and director-counsel of the NAACP Legal Defense and Educational Fund, are both scheduled to provide keynote addresses at the conference. Former US Senator from Oklahoma, Fred Harris (1964–1973), who is the only surviving member of the Kerner Commission, will participate in the a panel on the history and legacy of the Kerner Commission. That panel will be moderated by John Koskinen, the former head of the IRS, who had served as the legislative assistant to the deputy executive director of the Kerner Commission. Richard Rothstein, the author of The Color of Law: A Forgotten History of How Our Government Segregated America, a book on government-instituted segregation which was nominated for a National Book Award last year, is set to moderate a panel on housing. Other panels over the three-day conference will look at education, health, employment, criminal justice reform, and remedies to structural and state-sponsored forms of racism in the country. A full list of speakers, registration details, and other information about the conference are available at http://haasinstitute.berkeley.edu/kerner50.